Ladislav R. Hanka lives in Kalamazoo, Michigan and exhibits internationally. His work examines themes of life, death and transfiguration – nature as the crucible in which man finds a reflection of his own life and meaning. Over the years that has meant going to visit old trees and drawing them from life, artist residencies at Isle Royale, circumnavigating Lake Superior and of course angling for the various Trout and Pike he’s needed as models for his etchings. 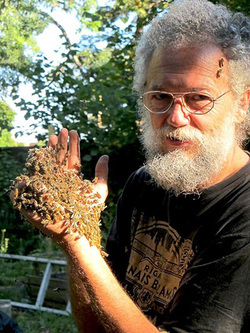 Most recently his work has also involved close collaborations with honey bees and placing his works into living hives. Hanka has had about 100 one-man shows and his etchings can be found in something over 100 public collections on all continents. The Permanent Archive of his works, books, proofs, documentation and correspondence is housed at Special Collections: Western Michigan University. I’ve been an independent studio artist since 1981, when I earned an MFA – the terminal degree in studio art. My studies took me far beyond the US - to Bonn, Vienna and Prague. In Prague, I apprenticed with Jindra Schmidt, an engraver of stamps and currency and could have been a counterfeiter, but for the dreariness of spending one’s days making money. Those studies set the stage for a life in pursuit of will-o-the-wisps, apparitions, enlightenment, old trees and some good fishing, taking me to the Himalayan Plateau, Patagonia, Peruvian altiplano and many other places one can enjoy exotic vacations or have one’s eyes opened. Everywhere I draw and rake those drawings back to the studio for transformation into etchings. I’ve had 100 one-man shows and my work can be found in something over 100 public collections. I have tried some different disciplines on for size, from translation to illustration and museum design, but mostly it has been the counterpoint of a life in the sciences that has allowed me to appreciate that my station in life is as an artist. I have collected bird eggs to study their development, banded birds in migration studies and killed way too many fish in ecological experiments of questionable worth. I have done environmental impact work for a nuclear power plant uninterested in results and synthesized questionable pesticides for a pharmaceutical firm. It helped make me who I am today, and informs my artwork to this day. I am also grateful that I need no longer quantify, collect, nor analyze the enzymes or entrails of living beings to earn my bread. I can today, like Carl Linnaeus, John James Audubon or a butterfly, go about gaining my insights through direct observation with pencil and paper in hand. Magdalena Abakanowiscz peeled the scales from my eyes with the probing question, “are we decorators, or Shamans? “That hand across the generations from an elder helped me frame the purpose of my work, and realize that the place of the artist has indeed become that of shaman, conjurer, trickster, story-teller - that of the visionary who breaks the deadly hold of predictability, death and taxes and gives us something more to live for. I have on occasion found myself contemplating an old tree and as I drift off into reverie with a half-completed sketch slipping between my knees , I become aware of a soul inhering in that wall of wood erupting from the earth before me. Intellect becomes subdued and the subtle energies become more discernible. The tree begins to expand and contract in nearly imperceptible, but very real, rhythmic pulses. Consciousness is a universal attribute of matter – something we knew as children and which we must later laboriously rediscover to attain that second order innocence. Eternal verities become evident only gradually as one assumes a certain humility about what remains unknown - even unknowable. And I grasp my pencil and circle that simple reality of the living breathing tree and point it out once from this angle and then with another crisp line pressed into the paper from another, closing in with word and line on the truth of that insight. I liked him, as he did not look for an ideal object. Is perfect and pure,” he blushed and turned away. Together with crumbs of bread, the accidents of life. But metaphor seemed to him something indecent. He would leave symbols to the proud busy with their cause. By looking he wanted to draw the name from the very thing.